This tutorial shows how you can install eyeOS on a standard Linux system. When you have finished this tutorial, you will have a full, working eyeOS on your server. 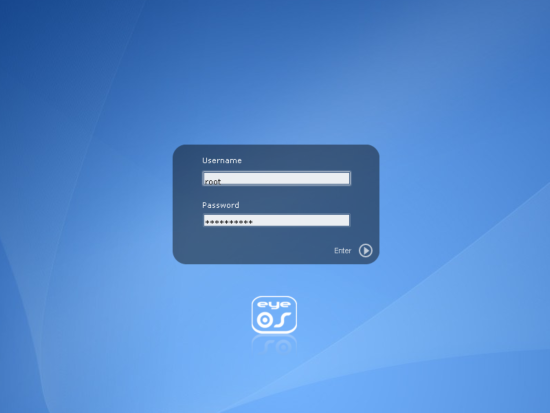 eyeOS is a kind of operating system which works online, i.e. it manages files on the server and enables the user to upload, download and edit files. 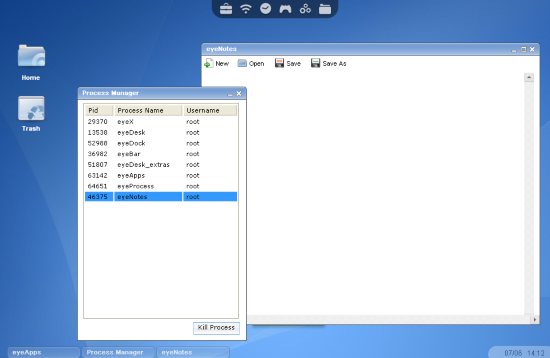 We use a Debian 4.0 system for this demonstration purpose. The first thing we need to do, is to install an Apache webserver and PHP. If you have this installed already, you can go straight to step 2.
and the program will do everything. Now you should find a file called eyeOS_1.0.1.tar.gz on your harddrive. This is only needed for the setup and can be undone later. The actual installation process is accounted for by a php script. We need to execute this in our webbrowser. To do this we navigate to the server or localhost, if you are sitting on the machine. You should see a placeholder page created by the Apache webserver to notify you that the installation worked. Now go into the subfolder eyeOS by appending it to the path in the address bar, and navigate to the file install.php, e.g. http://yourserver/eyeOS/install.php. When you klick on Install eyeOS 1.0 eyeOS will be installed and you are redirected to the logon screen. 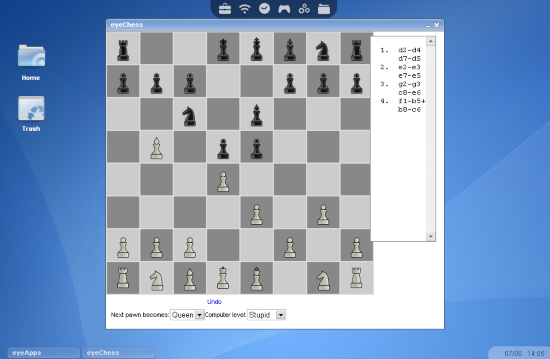 Some basic programs are already installed, in particular these are text editors, a calendar software, a calculator, a chess game and even a browser! 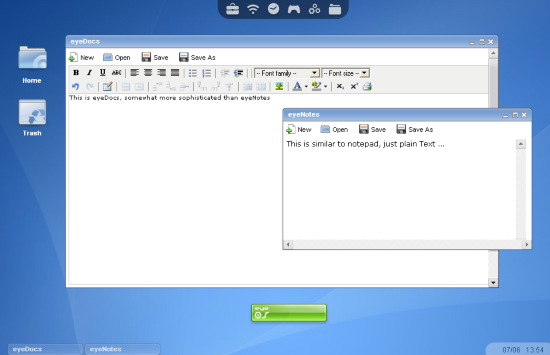 Regarding text editing, you are provided with "eyeDocs" which can edit and save text in a format using the HTML-font tags, and the more simplistic version, eyeNotes which can only edit plain text. Hopefully, you can now install and operate an eyeOS system under Debian. There is already eyeOS 1.0.3. With the new version the HOWTO works exactly the same way, except for the link to the download package. Can't wait till version 2.0 of eyeOS! from the hype I've seen it's going to have many improvements.